Need more information about booking Home 319406 ? A modern chalet bungalow with panoramic sea views. Set in it's own 2 acres of grounds, Seascape Lodge sits above Whitepark Bay on Northern Ireland's beautiful Causeway Coast and is only 5 minutes walk to the beach. The property is located close to the Giants Causeway world heritage site, Bushmills with its world famous whisky distillery and Royal Portrush Golf Club. 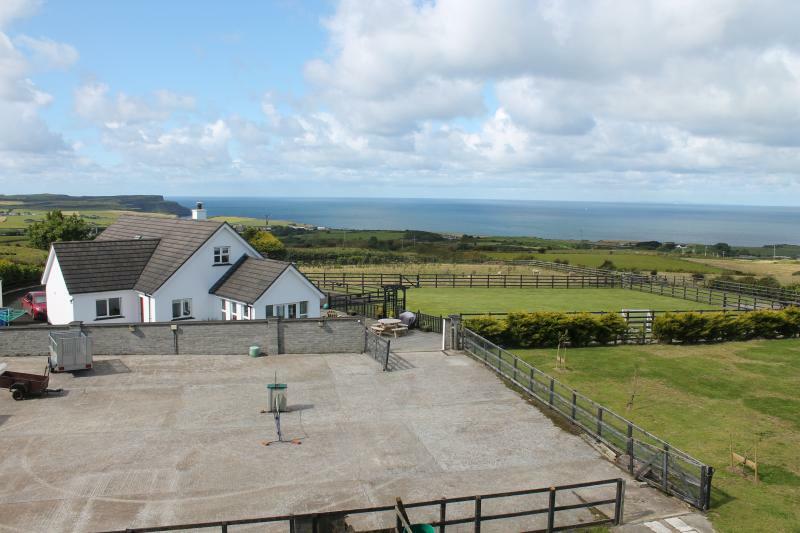 With 5 Bedrooms (4 with sea views), 3 bathrooms, lounge and sun-room both with sea views. Whether you are visiting all the nearby places of interest, enjoying the outdoors (walking, cycling, surfing or golfing) or just relaxing on the decked patio with gas BBQ or the lower patio with charcoal BBQ and outside fireplace, the Lodge comes with all the facilities required for a fantastic stay on the Causeway coast. Enjoy watching the sun rise over Rathlin Island in the morning and setting over the Causeway headland and Atlantic ocean all from the comfort of the patios or the large secure front garden. For golfers there is a short pitching practice hole to fine tune your game before playing the many excellent courses in the area. The 1st floor of the house has the master bedroom with king sized bed, a twin bedroom and a large bathroom with bath and separate shower. The ground floor has a twin bedded bedroom, a super-king bedroom and a double bedroom. The super-king and double bedrooms share an en-suite toilet/shower room. There is also a further large family bathroom with separate bath and shower. The super-king bed is a "zip & link" bed which allows it to be split into two separate single beds, which can be done on request and with an additional service charge applying. The ground floor accommodation is completed by a lounge (with stove) connecting through to the sun room, (we have recently installed an additional new log stove in the sun-room to make that area extra snug in the winter months), a large modern kitchen with dining area and connecting utility/wet room with an additional toilet. Please note that the minimum booking is generally for 3 nights, but 2 nights will be considered for families, outdoor pursuit enthusiasts and leisure breaks for more mature groups. We do not cater for what we would term "partying" weekends. 2 night breaks would attract our minimum rate of £720 plus the Holiday Lettings Booking fee depending on the season, please contact us for prices. We would normally be at the property to welcome our guests on arrival, provide some information about the house (heating controls etc) and also make suggestions about places to visit, restaurants etc in the area. We do not cater for "partying" groups who might not treat the property with the respect we like to see. Any accidental damage to the property or fixtures and fittings, should be reported to the owner and compensation made prior to departure. This Bungalow has 5 bedrooms, 4 bathrooms and sleeps 10. It’s been listed on Holiday Lettings since 14 Feb 2013. Located in Bushmills, it has 26 reviews with an overall rating of 5. The average weekly rate varies from £716 to £9733. Five star accommodation with stunning panoramic views of the coast. There is something for everyone at this beautiful house!! It's land outside allows plenty of room for kids to run around and there's plenty of adult spaces too!! The owners are friendly and very accommodating!! I would highly recommend this place and am planning to return next year!! It's worth every penny!! Our family enjoyed a lovely weekend. It was a family get together to celebrate my husband's birthday. The accommodation was as described and suited us perfectly. With many bathrooms and loos there was no queue in the morning. The views were unrivaled. Attractions were not too far away and there were a variety of places to eat. I have already recommended this accommodation to several people. We are hoping to go back for a week long stay later in the year. The only negative comment was that we were not staying longer. Estimated price per night based on a weekly stay. Owner fees of £205.00 per stay may apply. Enter your dates to see the total cost.